Spring and Summer, a Poncho is the Perfect Choice! Through Spring and Summer, a Poncho is the Perfect Choice! A poncho is the perfect clothing option for your wardrobe, suitable to wear through spring and even in the middle of summer! Ponchos are always in style and essentially timeless. A poncho is cool and carefree, and look stunning with any outfit, high heels or trainers. Regardless of your sense of style, you’ll always look fabulous. Katie Victoria, of www.katievictoria-textiles.com makes and sells a lovely range of handmade, machine knitted ponchos, and here is why her ponchos are a great choice for the warmer months of the year. Spring is the season when the sun comes out and the temperatures begin to rise, but even under the clear blue skies it can still be quite cold, and the weather can always change. It’s at a time like this that you’ll be glad you’re wearing one of Katie’s lovely, luxurious soft ponchos. A poncho is perfect for spring because it’s light and breezy, perfect for changing temperatures! Handmade on a knitting machine at her studio from high quality merino lambswool, Katie’s ponchos breathe beautifully, allowing you to feel comfortable throughout the day. The poncho provides just the right level of freedom while still feeling cosy, and the soft material feels wonderful against your skin. The designs suit the spring season too. For example, you can purchase a rose pink poncho from her store that matches the flowers starting to bloom. Katie’s ponchos are inspired by Moroccan tile patterns where the trim edge gives any spring outfit a splash of pizazz. The right poncho can certainly brighten up a dull spring day. Whether you’re going on a spring getaway, or just taking a walk along the beach, you’ll be glad of your unique poncho, keeping you warm whilst still providing the freedom you need as the weather begins to improve. Through the summer we all love staying out late in the evenings to appreciate those extra hours of daylight. Taking a poncho out with you means that, without taking up much space in your bag, or compromising on style, you’ll be prepared for when the temperatures drop as the sun goes down. You can lie on the grass and look up at the stars, or perhaps share drinks on the deck with your friends, wrapped up in style and warmth. Of course, the other thing about warm summer months is that air-conditioned indoor temperatures can drop to compensate. Whether you’re in town shopping, doing the weekly food shop or visiting a friend over coffee, you might find the indoors is a little chilly. Slip on your poncho, and you’ll immediately take that chill away, wrapped up in a warm luxurious layer of merino wool. A poncho really is an ideal option for every season. Whether you want to go for a stroll on a summer evening or look stylish in town through the spring, the lovely ponchos Katie make are the ideal option. As loungewear, or as an excellent choice for a day or evening out, the poncho is the perfect versatile clothing option. 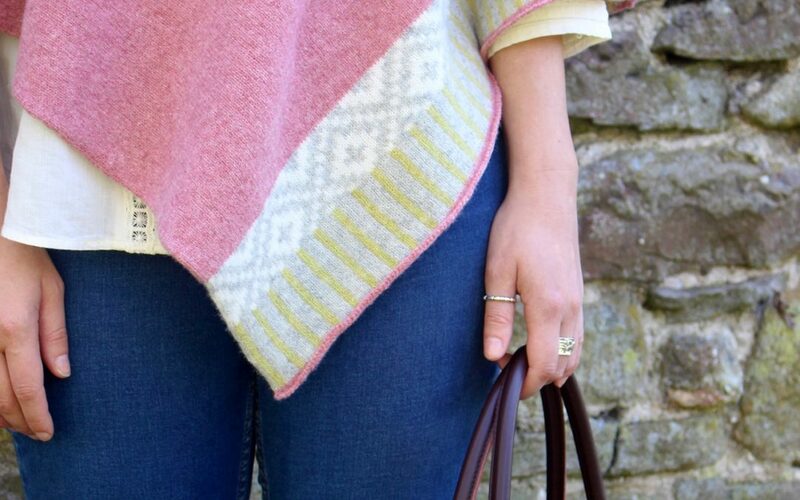 Visit Katie’s website at www.katievictoria-textiles.com, where you can either buy online or search for a stockist near to you, so you can choose your poncho in person. Either way you will be impressed by the quality of Katie’s knitwear!